Hawthorn is rated as intermediate. If you’re a relatively confident beginner, you can probably tackle this pattern with us. If you want to keep it simple, I’d recommend either the sleeveless version, the blouse, or even attaching the short sleeves of the blouse to the dress. The 3/4 sleeve, which has a cuff and placket, is probably the most challenging part of the whole construction. We’ll be providing information covering all three versions of the pattern. I will be making the sleeveless version, and also showing you how to construct the 3/4 length sleeve with cuff and placket, step by step. Rachel will be making the dress, but using the short sleeves from the blouse version. 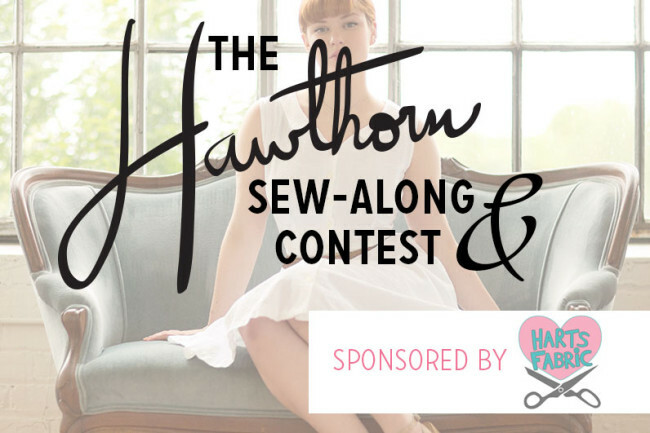 When you sew along with us, post pictures of your completed dress in our Flickr group with the tag “Hawthorn” to be entered into our contest. As some of you discovered last time, it’s a good idea to set up your Flickr account ahead of time and make sure you have at least 5 photos in your account. Flickr has spam prevention measures so that photos from brand new accounts may not show up right away. We will choose 20 of our favorites and open it up to the community here on the blog for voting. 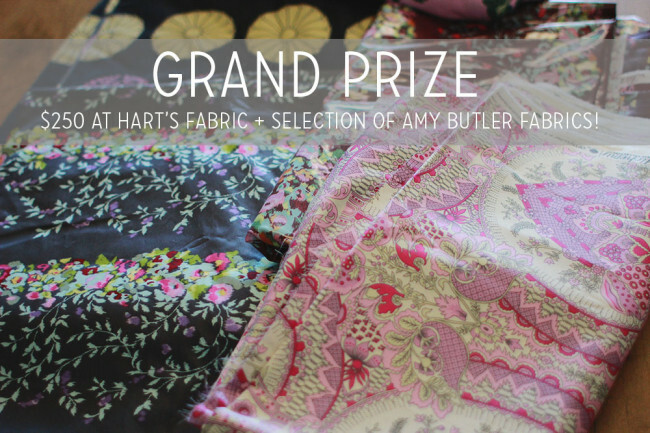 The grand prize winner will receive a $250 gift certificate to Hart’s Fabric (check out their shirting or cotton sections if you’re shopping for fabric) and a prize package from Colette Patterns of Amy Butler fabric, including sateen, velveteen, rayon, oilcloth, and canvas. 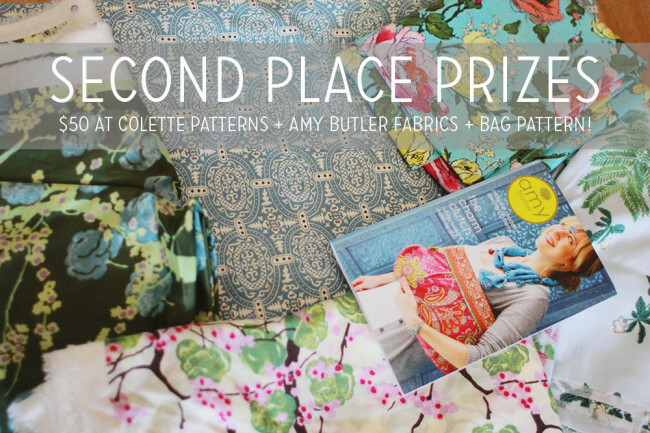 Two second place winners will receive a $50 Colette Patterns gift certificate, an Amy Butler handbag pattern, and a generous selection of Amy Butler fabric (exact designs may vary). The Flickr group is also a great place to ask questions and get help from each other. As always, we try to jump in when we can both here and on Flickr, but since we can’t answer every question, we encourage you to help each other out too! Joining us? Be sure to grab the code for these buttons for your blog! Those are amazing and generous prizes! My pattern came Friday already and I am very excited to start. I haven’t got time to join the Sew-A-Long right now, but looking forward to reading all the installments. Shoulder adjustments sounds very useful. I can’t wait to get started! Love this dress! Do I have to have a blog to participate in the contest? Nope, you just need a (free) Flickr account so you can post to our Flickr group. I’m going to participate but i’m waiting for my pattern to arrive :(. What happens with the contest if i’m a little behind? There should be plenty of wiggle room. We don’t start actually sewing until July 8, and then there’s a week between the last post of the sew-along and the actual voting. Whoops, that’s what happens when you copy and paste. Fixed now. Thanks! I can’t wait to get started! Who doesn’t need a good shirt dress? I had so much fun with laurel and seeing all of the contributions I can’t wait to see what everyone comes up with! I can’t wait for the sew along. I already ordered my fabric. But I’m having a little trouble getting the buttons to work on my blog. Is anybody else having trouble or is my blog just being glitchy today? I also grade between shoulders and waist/hips on most patterns (sometimes 2 sizes! ), plus, if you look at the schedule, she will cover a narrow should adjustment (I will probably need that and a FBA, lol). If you are not doing sleeves (and the neckline is OK), you can also, shave off part of the armscye. I wish I could join in! I want to make the blouse, but I’m moving and don’t even have a needle and thread to use right now!!! So I have made the jump! I have not ever participated in a sew along but I love this dress and my youngest daughter will look wonderful in it. I ordered the pattern today and will anxiously await it’s arrival in the mail. Wondering if you will/can cover alterations for larger waists? My measurements are all the same (44,44,44) yikes! It won’t be covered in the sew-along, but perhaps you can get help from other participants in the comments or on the flickr group! I do wish we could cover every adjustment. If you have access to the library, they typically carry back issues of “Threads” magazine. In the May 2009 issue they have a great article on pattern correcting for a larger midsection. I hope this helps! I am so excited about this pattern and sew-along! It’s so my style, and I’m already envisioning many, many versions! I was wondering if you could cover how to lengthen the bodice, or if someone could direct me to a good resource for that? I have a long torso, and I’m a beginner. When I made the Laurel, I had to add to add 3/4″ between the shoulders and bust (plus 1.5″ between the bust and waist, but that part was easy) to get the bust and waist to sit right. I just kind of guessed and adjusted that time, but with the collar detail on the Hawthorn, I have no idea how to do this, and I want to learn how to do it “right” since it will probably be a regular adjustment for me. Will the fabric need to be purchased from Hart’s, like their previous contests? Not that I mind, as they have a great selection. I don’t want anyone to miss that detail, if that is the case. Not at all, fabric can be from anywhere. they do have lovely things, but you are under no obligation to restrict your purchase. Thanks Sarai! I’m hoping to stash bust for this contest, just like the Laurel! I’m making some fun Laurels with fabric from Hart’s and working with new-to-me fabrics like chiffon and lace. Love Hart’s!! I’ve never taken part in a sew along but I’d love to start with this pattern. I hope I won’t make a huge idiot out of myself but I guess every mistake we make is just preparation for the next project. Never participated in a sew-along before but I am very excited that this is my first one! I hope I can keep up and get the sewing done in this extreme heat (currently) in the evenings after I am done work. Hoping to make the one with the longer sleeves as it would be a beautiful fall dress – I’d get much more wear of it in this weird Canadian weather! I just bought the pattern and am excited/nervous about joining the sew-along. This is the first sew-along I’ve participated in and my first Colette pattern purchase. I think the dress is beautiful. Only 2 days away?!?! I ordered my pattern last week and it hasn’t even shipped out yet, I’m going to be weeks behind! See my comment above. We don’t even start sewing the dress until July 8 and have a full week of wiggle room after the last post. I’m so excited about this! My fabric arrived yesterday, and it’s beautiful! Can’t wait for my pattern to get started. Thanks, guys! I was on the fence for a bit (I should be writing a thesis…) but I’m in! Just ordered my pattern from a UK stockist and I already know the ideal fabric for this! Can’t wait to join in on a sew-along for the first time! I have never lost my thirst for a good shirtdress. I used to play in my mother’s (read Beatnik type and former model) closet trying them on while she was at work. I am echoing Chantal’s question about adjusting for long torso, especially upper. I was looking forward to the shoulder adjustment, but apparently that is for narrower rather than wider? Somehow I wind up with drooping armscyes in the sizes I choose. perhaps someone could favor me with a tutorial link. I think the white eyelet version photographs better than the blue chambray; can’t wait to see the Flickr versions. So excited! Not sure if making dress with short sleeves/sleeveless, or the cute top. Waiting for pattern to come in the mail. Looking forward to seeing what everyone’s projects look like. Love this blog, this site, all of this!!!! 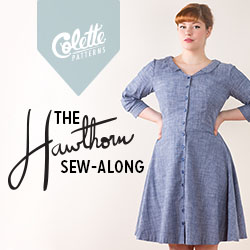 how do I participate in the sew along (Hawthorne) w/o a blog/flicker and all of that? I’m not concerned with the contest………..just want to follow the sew along. will each days info be posted with access via your daily ‘blog’ that comes to my e-mail? Yes, these posts will appear here on the blog on the dates listed above. This is great. Hawthorn will be the most advanced sewing I’ve done, so I’ll need the sew-along. My first sew-along! I am in the UK and managed to get a copy of the pattern over here soon after it was released. I have an art deco style Liberty Lawn fabric ready to go and today I bought some antique Honiton lace motifs to put on the edge of the collar. This pattern is so beautiful and I am excited to be participating in my first sew along! I am using this swiss dot chambray, because it was just too cute not to. Karen, that is exactly the fabric that I purchased as well. I will be pairing it with a red belt. Can’t wait to get started. I seem to have missed the first two sessions. Is there a way I can access this information. Is there an easy way to get all of the sew-along posts in one place? I don’t see them listed all together somewhere on this site…or grouped together by a tag…! Help, anyone? Or, do I need to just look up each one up by the date they were posted…?